Uninsured motorists account for about thirteen (13) percent of all drivers on the road in the US. While Pennsylvanians are slightly more likely to be covered by state-required auto insurance, there is always the chance that an at fault driver will either have no insurance, or be unable to cover damages sustained in an accident (under-insured). Uninsured and underinsured motorcycle coverage is not required by law in PA, but we will discuss why bikers should seriously consider purchasing the added protection. At The Law Office of Kamensky, Cohen & Riechelson, our personal injury attorneys have been serving motorcyclists injured in accidents since 1972. Our firm believes in protecting the legal rights of bikers throughout Pennsylvania, including towns like Northeast Pennsylvania, Levittown, Feasterville, Bensalem, Millbrook, Penndel, and the greater Bucks County region. Lean on our experience and intimate knowledge of the PA civil court system to seek full and fair compensation for injuries resulting from your or your loved one’s motorcycle accident. Call our office to speak with a member of our personal injury legal team today in a free and confidential consultation regarding your individual needs and concerns when it comes to any type of motorcycle or other motor vehicle accident injury. 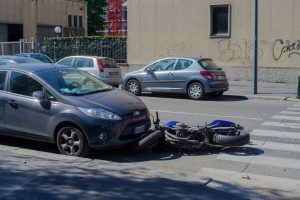 When a motorcycle or other motor vehicle accident leads to injury, most personal injury claims will be leveled against the insurance companies of the at fault individuals. In other words, our Levittown lawyers will show that an individual is at fault for your accident, then seek damages through their insurance provider. If the at fault individual has no auto insurance, the injured parties have a few available avenues. The first is uninsured/underinsured coverage through their auto or motorcyclist insurance policy. This policy will protect victims of injurious accidents by providing coverage. If the other party has no motor vehicle insurance, this coverage can mean the difference between receiving compensation and being left with nothing. This protection essentially covers motorcyclists who have been injured in an accident regardless of the insurance policy of the at fault party. Without this coverage, individuals injured in motorcycle accidents are gambling that the at fault party is sufficiently insured to cover the damages. When Will My Uninsured/Underinsured Motorcycle Insurance Apply to a Motorcycle Accident in Bucks County? Underinsured coverage is particularly important to bikers, as accidents involving motorcyclists are statistically much more likely to involve serious injury or even wrongful death. Most auto insurance policies will not cover the high damages which will be owed in these scenarios. Underinsured policies of the victim will cover the remainder of the damages which may not be available from the at fault driver’s insurance provider. Let’s look at two hypothetical situations and how this coverage can impact a personal injury claim. If a motorcyclist is injured in an accident and the at fault driver has no auto insurance, the motorcyclist’s own uninsured/underinsured coverage can come into effect paying damages potentially as high as the legal maximum of $1.1 million. If you do not have this coverage, our Millbrook attorneys may still sue the driver for damages, but it is extremely unlikely that the individual will have the assets to compensate you for your claim. Another example would be where the at fault driver has minimal coverage. Minimum coverage in Pennsylvania will cover up to $15,000 per injured person or $30,000 per accident. If you have sustained serious injuries and/or damage, this will likely not put a dent in your expenses. Only uninsured/underinsured motorcyclist coverage can ensure you are protected for the remainder. The personal injury attorneys of Kamensky, Cohen & Riechelson take pride in protecting the legal rights of bikers in Pennsylvania towns including Levittown, Northeast Pennsylvania, Millbrook, Feasterville, Penndel, Bensalem, and all of Bucks County. We believe that all motorists and motorcyclists in PA should have adequate uninsured and underinsured coverage to protect themselves in the event of an injurious accident. Whatever your situation may be, we will be willing to hear the details of your case and to discuss what we can do to seek full and fair compensation. If you or a loved on has been injured in a motorcycle accident, contact us online or through our Bensalem offices by calling (215) 337-4915 today. A member of our legal team will be standing by to discuss your accident, your injuries, and your potential personal injury claim.